Still waiting for Moriarty to take a bow. Nevertheless, an enjoyable mystery with ciphers and coded messages. Lord Bancroft (AKA Mycroft Holmes) presses his suit and manages to get Charlotte's attention with his garish taste in interior decoration (which Charlotte shares) and by acknowledging her intellectual abilities. He also lets her examine the bodies of murder victims, so he definitely knows the way to this lady's heart. Is it enough to tip the scales in his favor? 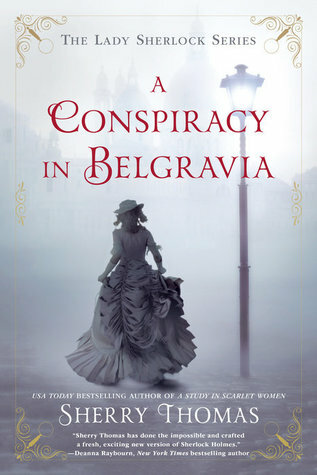 Sign into Goodreads to see if any of your friends have read A Conspiracy in Belgravia. 41.0% "He really meant for her to see the victim--and no mention of anyone's delicate feminine sensibilities. "I can do that," she said, scarcely able to keep wonder and eagerness out of her voice."